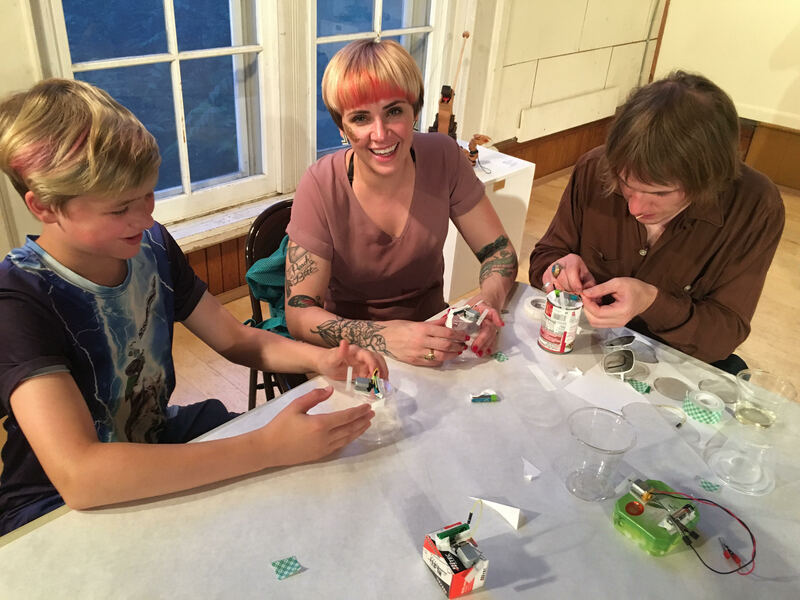 I hosted a “tiny robot” build at an art opening last night. This was a first for me and I have to say, it was a good pairing – the art opening and the build. Artists are makers and so they participated fully and iterated with enthusiasm. I had a blast working with them. Times like this I wish I had a voice-activated camera mounted to my head because the image above was the only picture I was able to snap. Right at the end of the night. Good picture though. Happy family! Additionally, I had several artists chat with me about adding motors to their work. One had a motorized piece in the show – a first for her and it looked great. And another artist said to me proudly, “I just got my first Arduino in the mail today. I want to make my work more interactive.” Both of these artists were in their sixties, by the way. Lifelong learners! If you are in the area, check out the Cayuga Arts Collective spring show. I had a chance to walk around the room before the doors opened. Beautiful work. Affordable, too.